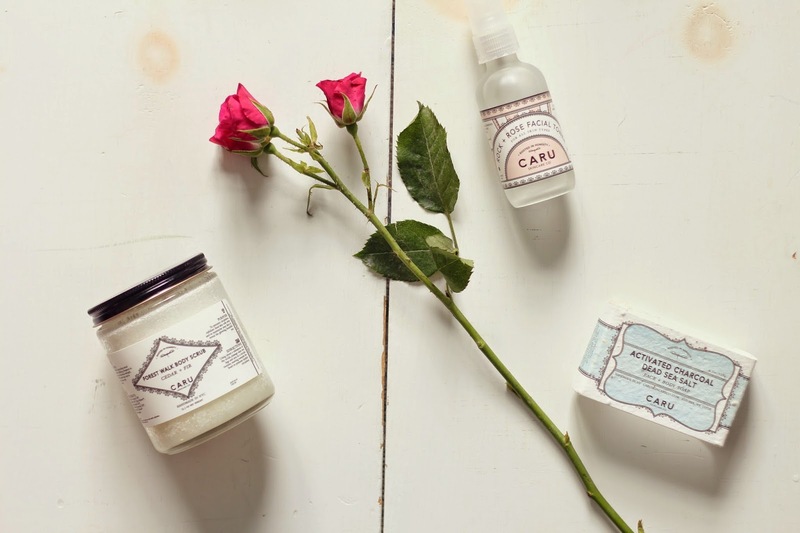 For my next entry in my Healuxe Beauty introductions I'm so excited to tell you guys a little more about the incredible Caru Skincare, a NYC based skincare producer that strives to use the very best, most eco-friendly ingredients. I've been testing out a few of their products for the past couple of weeks and can safely say that they are all incredibly effective, with both beautiful and truly innovative packaging. First up is actually a seasonal piece from the line, their Forest Walk Body Scrub*. With essential oils of Cedar and Fir, this gem smells to me like Christmas in a jar. It's an incredibly fresh smell that is the perfect start to any morning, helping wake me up and give me a bit of energy. As much as I love the scent, the true standout to this guy is the formula - I don't know about all of you, but in my experience it is incredibly hard to find a decent body scrub formulation. I often find body scrubs to either be too crumbly (meaning more of the product ends up on the shower floor than on your body) or too liquid-y , without enough scrub to actually exfoliate anything. This scrub has a formula containing ingredients such as sea salt, coconut oil, shea butter and sunflower oil, making it not only an effective scrub but also very moisturizing and nourishing for your skin. What I love so much about the formula to this is that it has the perfect ratio of oil to scrub - the sea salt is very compact within the jar, but easily spreads across your body as you rub it in. Overall it's one of the best body scrubs I've ever tried, and I have tested out many. Next up is their fabulous Rock + Rose Organic Toner* a bestseller of the line, and with good reason. The formula is alcohol free, instead containing ingredients like Rose, Geranium and Rock Rose Hydrosol which are all incredibly soothing floral waters that work to restore the PH levels of your skin. I have fairly sensitive skin and often find that toners can strip my skin of any natural oils, leaving it dry and dehydrated. What I love about this one is that it not only helps to tone my skin after cleansing but is also a great refresher throughout the day - I spritz a little bit on top of my made up face halfway through a long work day and feel instantly better. The scent is soothing and floral, different than just about any product I've ever used. On top of all of that it also comes in a gorgeous glass spray top bottle with a photodegradable label, so you know that the bottle can be recycled after use. Speaking of eco-friendly packaging, perhaps my favorite product from the line also has the coolest packaging I've ever come across. The Activated Sea Salt + Charcoal Soap* (which, I should note, is not fully pictured above because I had already gone through a portion of it) can be used for both your body and face and is made up of cleansing ingredients such as Dead sea salt, Activated charcoal, Tea Tree oil and sustainable palm oil. The soap's scent is both sweet and musky with a mild citrus undertone which I absolutely loved. The formula is incredibly nourishing and detoxifying due to the excellent ingredients, and I found that using this for just a few days cleared up any redness or irritation on my skin. And what could make this dreamy formula even better, you ask? All the soaps from Caru are packaged in seed paper, meaning they can be planted and you can grow some gorgeous wildflowers right from home. I'm in the process of growing mine right now and am so excited to see the blend of Forget-Me-Nots, Baby Blue Eyes and Evening Primrose. The idea of using seed paper is quite genius and makes an already incredible product that much better. So if you couldn't tell from this rave, I'm just a bit in love with this line. It's one that I had read about on various green beauty blogs before trying myself, and now I count myself as a real believer in the wonders of the line. I can't wait for you all to be able to try it out, and I'm completely honored to be able to sell it at Healuxe Beauty.